High Flyer - c.1920, Cut Paper Silhouette. Signed WHD in pencil, lower right. 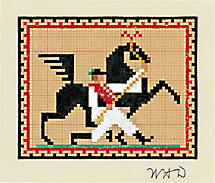 Image size 13 13/16 x 9 7/8 inches (351 x 251 mm); sheet size 16 1/4 x 11 3/4 inches (413 x 298 mm). A finely designed, precisely executed cut paper silhouette; black wove bond spot glued to cream wove cover stock. Minor traces of glue staining, otherwise in excellent condition. Ex. collection Mary C. Liberatore, acquired from the artist. 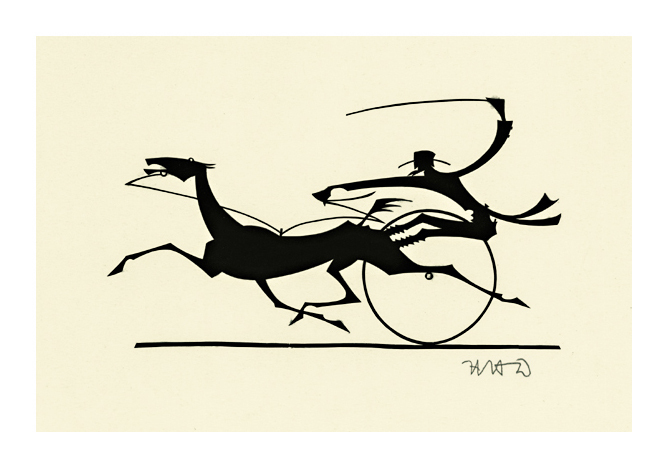 Cossack Dancers II- c.1920, Cut Paper Silhouette. Signed WHD in pencil, in the image, lower left. Image size 7 1/2 x 13 3/8 inches (191 x 340 mm); support sheet size 10 x 15 3/8 inches (254 x 391 mm). 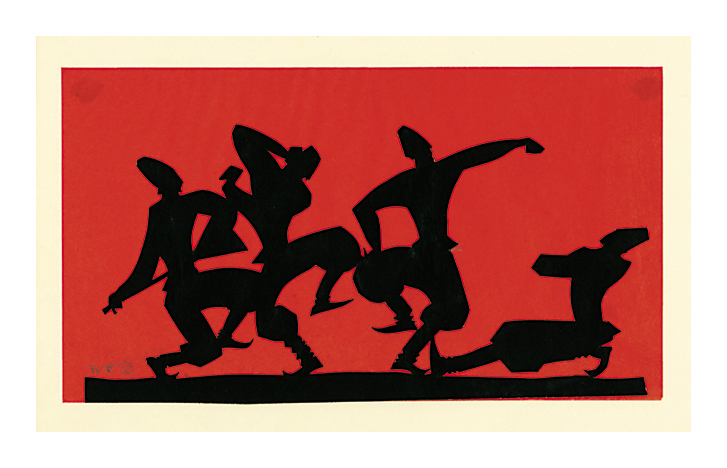 A boldly executed cut paper silhouette; black wove bond spot glued to a crimson tissue background, adhered at the top left and right sheet corners to the original support mount. Toning to the tissue at the glue spots, otherwise in excellent condition. Stamped lower right verso FROM The Collection of MARY C. LIBERATORE. 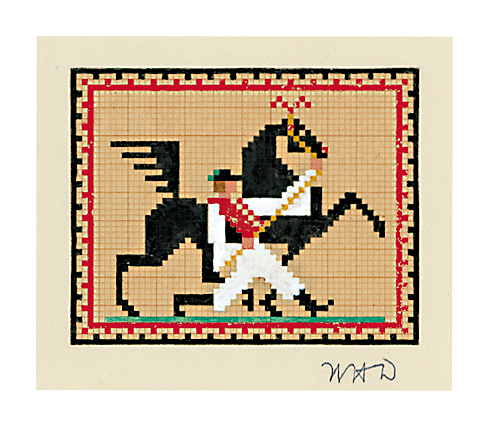 Hungarian Dancing Horse- c.1920, Gouache and India Ink on Graph Paper. Signed WHD in pencil on the support sheet, beneath the image, lower right. Image size 3 7/8 x 4 3/4 inches (98 x 121 mm); suppport sheet size 7 3/4 x 8 3/8 inches (197 x 213 mm). A fine modernist design, on graph paper laid down by the artist onto a cream wove support sheet, with margins (1 3/4 to 2 1/4 inches). Minor scattered flaking to the red gouache, otherwise in very good condition.